Hahaha, you are right, it was too much in one sentence...anyway, they can skip the flashing orange light if they elaborate all other backhoe functions properly. I just thought children (including me) would love such a new thing on a construction machine. They managed to implement that in some 80s Town sets, so why not? Imagine it at night supplemented by some normal PF lights. It would look awesome. Good question about the motor though, I would use L and two small pumps to get enough air pressure. IMO it is time for a full pneumatic and yellow backhoe flagship again with 10 big cylinders + motor driven compressor with big claas tyres back and new small claas type tyres front with fake engine, pendular suspension and flashing orange light on top. 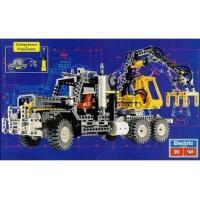 Sad to hear that...agree with the comment that this collection should be placed in a LEGO Technic historical museum. And hope you will continue your great work with Technicopedia. In my case it was also partly responsible for getting back to LEGO after 10 years of dark age. I think you are right. This is something really exciting regarding 2h and can lean toward IR controlled pneumatic models (backhoe) in the future. Yes, 42056 is available in most stores and no sign of retiring soon at all. Thank you very much for this information sir. If this list is complete 42056 Porsche from 2016 will be still available in 2019 or probably for a longer period. In my opinion TLG wants to boost sales figures regarding the new super car hopefully coming out this summer and creating the new collectible series of ultimate Technic which was mentioned before by the company itself. And maybe they decided to keep production run much longer for these special Technic sets (similar to mudular buildings) in order to decrease profit of scalpers and Lepin. I would support this strategy. On the other hand TLG had very strange strategy regarding flagship 42070 last year which I do not support. RRP was insanely high and dropped right after the release date at many resellers with huge amount to keep planned sales figures I believe. And I agree with agrof at this point that it was not the best way to treat with long-term fans. If 42070 had been priced at EUR 175 (which for me is the right price for a MISB 42070 set) much less dislike would have come I think. @curakar Very nice collection there, I love your MODs. I almost forget this super topic and I haven't updated my collection (see below) for almost a year but will try to add all the sets I bought since. We would like to make it more authentic but the licensing partner don't. Agree with you, it is one of the very few B models I will assemble after the A. Functions are pretty awesome and finally a trash truck, although not as spetacular as 8479 Barcode Multi Set. @tohan Well spoken. Regarding the 3rd gear in 8860: it was there only to use with the 4,5 volt motor available at that time (which was capable to handle the car only in that gear with its low torque) and not to use driving the model by hand. There was some indication regarding this in the instructions but not clear enough that is true. I got 42056 Porsche this Christmas and I really like it to be honest. I read many reviews beforehand including Jim's and I totally agree with his final conclusion: "if you are looking for the perfect set, you better look further". On the other hand this Porsche is a great model. It has a marvellous PDK shifting gear system never seen before in an official Technic set and it works perfectly after minor modification. I implemented Attika's change and fixed the wrong gear sequence only. It is beautifully designed and has all the proper functions a Technic supercar should (at least not crappy motorized functions). I also miss the HOG steering and do not understand the wrong gear sequence it has out of the box but I can easily fix it. I do think that LEGO has to put much more effort into user acceptance test before releasing such an exclusive set. And I also remember that some functions were turned down by the Porsche AG itself and not the designer (rear wheel steering comes to my mind but probably they dropped the HOG steering for some reason as well). All in all I see this set as a beautiful (and expensive) experiment step in creating the outstanding LEGO Technic supercar, a great successor to the original series (853, 8860, 8865, 8880, 8448) - and hopefully the first piece of a new series.